In this course, we'll review the market analysis presented as Behind the Scenes in the dedicated sessions this month. You will view some short messages and do exercises to reinforce your learning. 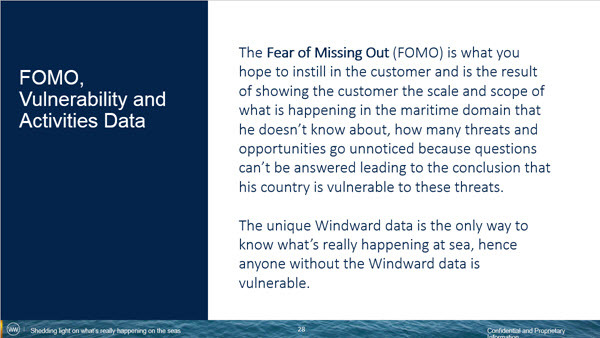 Read: Who needs Windward Intelligence? Read: Who are they, specifically? What are the two criteria for an organization to be a Windward prospect? The government agencies mentioned are engaged in operational or strategic decision making. Intelligence agencies deal only with domestic maritime intelligence. They gather, process and analyze maritime surveillance information. Police are one body belonging to Law Enforcement. Coast Guards and Border Patrols do the exact same work. Fishing authorities usually work under the auspices of the Coast Guards. These are operational organizations, focused on and reacting to what is happening inside their jurisdiction, according to local laws and . 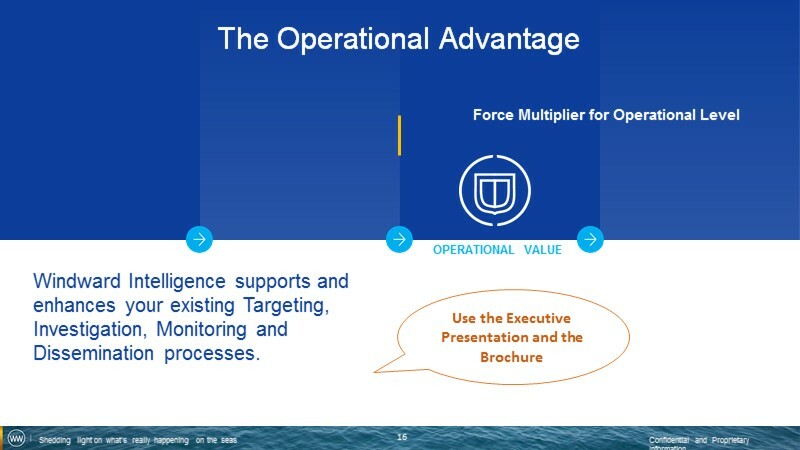 This means their intelligence work is around the targeting of events and vessels for being illegal or risky, and interdicting those to generate (and prosecute). 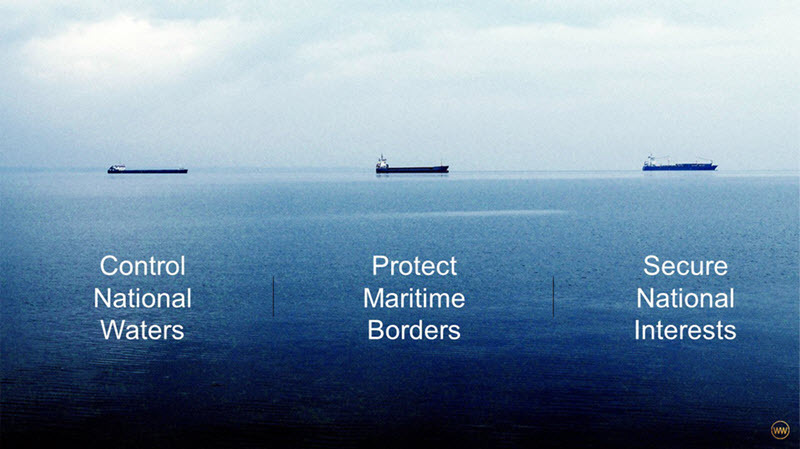 What is the main focus of agencies that protect maritime borders? The main focus is on intelligence gathering. The main focus is on the local arena. The main focus is on situational awareness. Match a value type to an audience. Vet everything that happens in your waters; They do it manually today, so they can’t possibly vet everything. 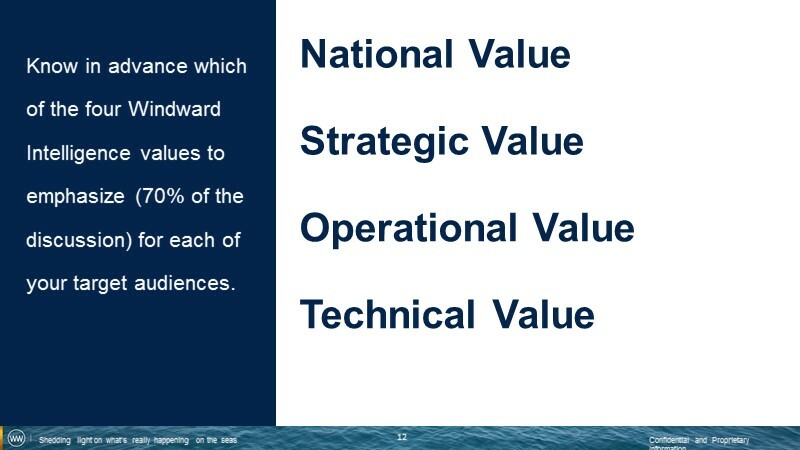 Effective Maritime Situational Awareness, ‘finding the needle’; today they most likely do not have an effective MSA, since they are missing so much of the picture. Closing the loop, from intelligence to interdiction, evidence; the window from start to finish – detection to interdiction - is short, so time is of the essence. Evidence slips through their fingers if they don’t react in time. 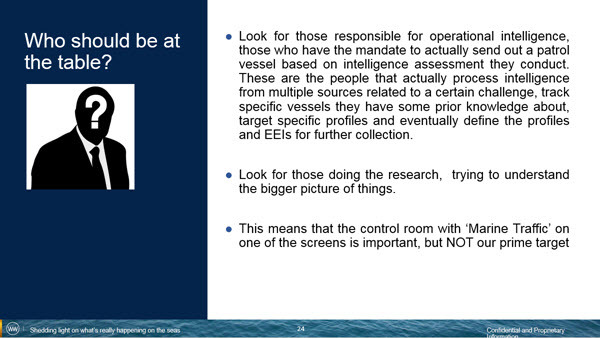 Emerging threats, resources protection, enforcement; What’s happening in deep sea, where you don’t usually monitor. 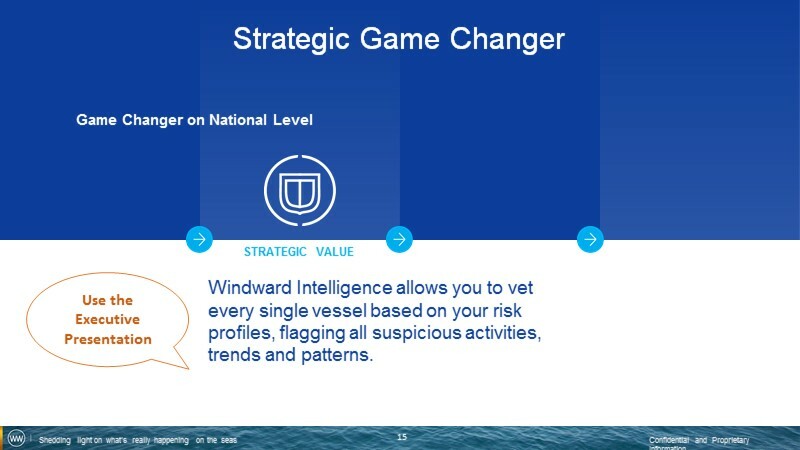 Find out how they tackle these tasks today and tell them how Windward Intelligence can help them do it better. Drop each topic into the appropriate box. 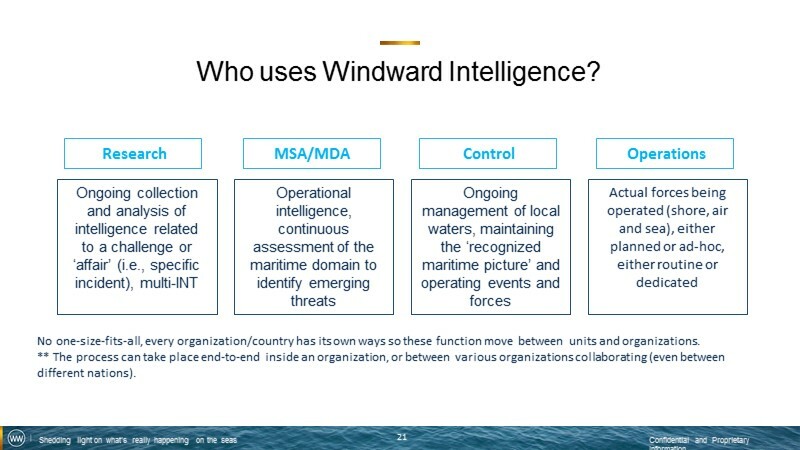 Read: Who uses Windward Intelligence? Drag each of the texts to the correct space. Read: Who should be at the table? Summarize: who should be at the table? Match the beginning of each question to an appropriate ending. 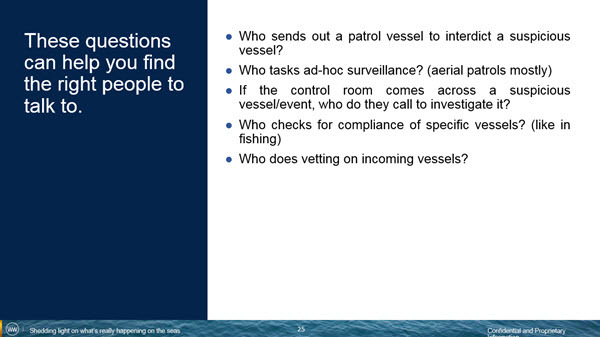 to interdict a suspicious vessel? who do they call to investigate it? Current Practices have a limited scale and scope of questions that can be answered (limited , limited , limited , limited ). 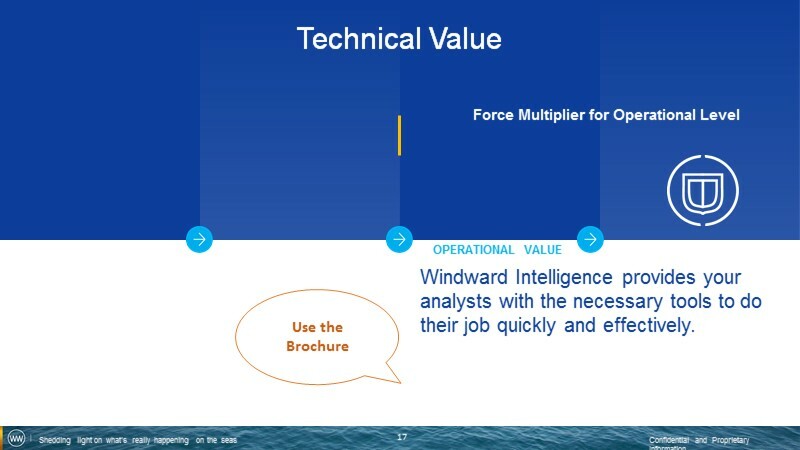 Write at least four pain points that Windward Intelligence addresses. 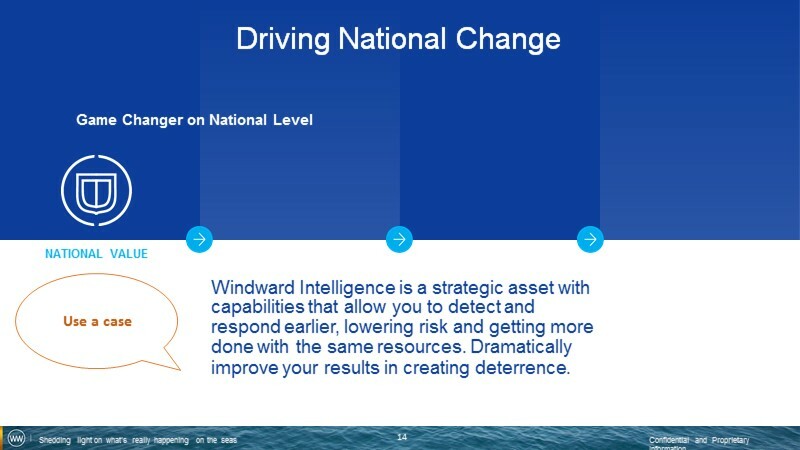 Write at least four advantages that Windward Intelligence offers compared to current practices. What is FOMO and how can it help you in a sales pitch? In writing, summarize for yourself the main points of this course.